Welcome to Today@WKU, the daily newsletter from WKU Public Affairs, for September 24, 2018. 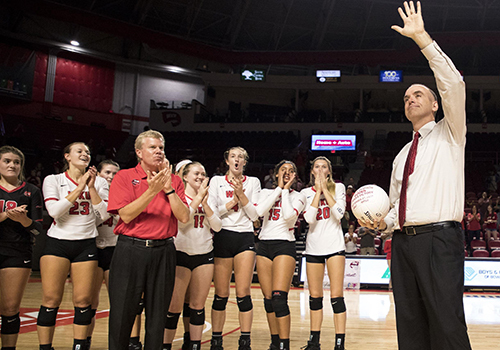 Congratulations to WKU Volleyball Coach Travis Hudson on reaching his 600th win on Friday night. Hudson won No. 601 on Sunday as WKU claimed its 57th straight home conference match. View from the Hill: WKU opens center devoted to aging sciences: With a dramatic shift in the aging population in the coming decades, a new center will put WKU students on the front lines of researching ways to deal with aging challenges. WKU's Amy Bingham has more on the Center for Applied Science in Health and Aging (CASHA) in the View from the Hill. 'Words I Never Heard': WKU graduate to present Mary E. Hensley Lecture Tuesday: The Mary E. Hensley Lecture Series, hosted by WKU’s College of Education and Behavioral Sciences, will present Words I Never Heard by author and WKU graduate Lynnie Vessels on Tuesday (Sept. 25). Soccer: Lady Toppers Fall 2-1 at Louisiana Tech: In its third match of a grueling five-match road trip, WKU fell 2-1 on the road at Louisiana Tech on Sunday afternoon. WKU (2-5-2, 0-2-0 C-USA) put six of its 10 shots on goal and continued its recent run of strong defensive outings, allowing the fourth-fewest goals the Lady Techsters have scored in a match this season. Next: WKU at Charlotte on Friday. Football: Duncan Leads WKU's 28-20 Comeback at Ball State: Steven Duncan came off the WKU bench to throw two second-half touchdown passes and engineer the Hilltoppers' 28-20 come-from-behind win at Ball State Saturday afternoon. Next: WKU vs. Marshall this Saturday. Men’s golf: Six Golfers in Competition for Tops at Bearcat Invitational: WKU Hilltopper Golf will have the opportunity to put an extra player into competition this week at Cincinnati's Bearcat Invitational. The event, which takes place today and Tuesday at the par-71, 7,150-yard Coldstream Country Club, allows teams to play six golfers instead of the usual five, while still counting the best four scores. Women’s golf: Lady Toppers Head North for Boston College Intercollegiate: Coming off the best 54-hole team performance in program history, the WKU Lady Topper Golf squad heads into its second tournament of the fall this week at the Boston College Intercollegiate. The Lady Toppers will be one of 17 programs competing today and Tuesday at the par-72, 6,137-yard Blue Hills Country Club in Canton, Mass. Men’s basketball: Hilltoppers Make Visit to The Center for Courageous Kids: WKU Hilltopper Basketball visited The Center for Courageous Kids on Saturday planning to work through several basketball drills with the campers, but it came as a shock to no one that it ultimately turned into a dance party. "The team's big on dancing," WKU graduate senior forward Desean Murray said with a laugh. "We love to have fun with each other. We love each other, so I saw that coming." Basketball: Hilltopper Hysteria to Take Place October 18: WKU's annual tip-off event for Hilltopper and Lady Topper Basketball, Hilltopper Hysteria, will take place Thursday, Oct. 18, beginning at 6:30 p.m. Parking and admission are free for the event in E.A. Diddle Arena, which features two new state-of-the-art, high-definition video boards and a brand-new sound system this year. Hilltoppers break into win column by following through with finish mantra: WKU finally finished. Now it has to find a way to start something. A 28-20 win over Ball State on Saturday in Muncie, Ind., broke a five-game losing streak for the Hilltoppers. It was a triumph in which they harped upon their ability to play well – in spurts – in all four quarters. Now WKU (1-3) comes home to begin league play against Marshall (2-1) with some renewed spirit and energy looking for its first winning streak since a four-game run from Sept. 23-Oct. 20 of last year.